Draft at the brewery. Dark brown body, small beige head. The aroma has cognac. The taste is mellow. From tap at brewery. Nice brown color. Main body flavor of tomato passata, notes of copper pennies and stale bruschetta. Overall would pair well with a bowl of bolognese. Keith and Tchad approve, slightly! 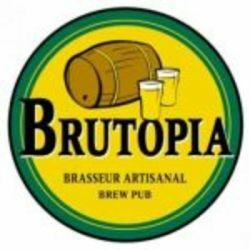 Cette bière brune laissant échapper quelques rayons acajou ne mousse que très peu. Ses effluves enivrantes de noisettes et de sucre brun n’ont d’égal que son goût crémeux de malt joufflu (!) et de caramel. Une légère pointe d’amertume s’immisce dans la finale pour donner un kick supplémentaire à une bière déjà excellente. Au-delà de ses caractéristiques physiques et sensorielles, la Nut Brown Ale aura toujours une place spéciale dans mon coeur. From tap at the brewpub. Pours clear and golden dark brown with a small tan head. Aroma is roasted malty and slight breadish. Ends dry, roasted and malty. Roasted malty and slight bitter finish. on tap at brewery. clear dark copper, almost pale brown with a decent off-white head. cereals,malty, very nutty, hint of sweetness, hint of honey, vanilla. nice hop profile - floral, grassy and citrus, but mainly floral. light to medium body, aggressive carbonation. fairly decent nut brown. yep. Draught, from the brewery. A fairly standard brown, not bad not too good. low characters arrgh. light in colour, malted notes and some sweetness again, some caramel. palate is caramel and some nutty bitterness but it is a light brew.